My older daughter has been accepted by a number of colleges, among them UC Santa Barbara. I’m tempted to say, in a grave tone, “Don’t do it, kid. You don’t have to go down the same road I did.” But actually, I’d be stoked if she followed in my footsteps. Then I could lord it over her—you know, “I paved the way, I got their first,” etc. (Yes, of course I’m still joking.) Anyway, in honor of this opportunity, and of my (first) alma mater, here’s another UCSB essay from my archives. I have a friend who would kill to attend UCSB, based solely on the abundance of gorgeous girls here, but he can’t get in because he has never taken, and in fact refused to take, a foreign language class. All the schools in the UC system require like three years of a foreign language, so he’d have to take care of this at a community college and transfer in. I wish I could get through to this guy. Foreign languages classes are actually kind of a hoot, especially at college. You get some of the wackiest, most behaviorally bizarre instructors. A trained student can spot a foreign language instructor a mile off. First of all, they never wear normal looking clothes. I think they do all their shopping in Europe, or maybe at a special foreign language instructor boutique. It’s hard to describe these outfits. Let’s just say if every garment could be a beret, that’s what these clothes would be. Another instant sign of a foreign language teacher is his or her tendency to speak English with a foreign accent. Surely some of these people are native born, or have at least been here long enough to adapt, but I can’t help but think they’re clinging to this accent as some sign of authenticity. Kind of hypocritical, isn’t it, when they lower our grades for lacking a perfect accent in the foreign tongue they’re teaching us? Here’s another weirdness: all the foreign language instructors smoke. Every last one of them. Just cruise by Phelps Hall, where they hang out between classes, and you’ll see them, standing around puffing away. They can’t help but to look self conscious, because they know that besides your occasional “social smoker” (i.e., who only smokes when getting wasted at a party), they are the only smokers at UCSB. They are also the only instructors whose hanging out we can witness, because other instructors, who don’t have to worry about stinking up their classrooms and offices, hang out indoors where the students can’t get at them. This seems like a minefield for the instructor. Sure, he or she could try to go by body type, on the theory that if nobody in the class is overweight, they’ll all be comfortable being compared. But of course that’s absurd; distorted self-images are rampant among the college set. And it’s not like the instructor can just ask us. Who’s going to raise a hand and say, “That subject is strictly off-limits for me owing to my poor self-esteem”? Nobody, that’s who. Surprisingly, my instructor ignored the textbook’s advice and went right ahead with calling students up to the front of the room to be compared. To my great relief, nobody seemed uncomfortable. The only problem was that all the girls in my class are about the same height and weight, making comparative statements impossible. Maybe that’s why so many of us bombed the last test. Let me interject at this point: the English version of “Little Red Riding Hood” is a lot better than the French, since in our tale both the grandmother and Little Red Riding Hood get eaten, and then the wolf gets killed, instead of the boring ending where the girl simply kills the wolf. Meanwhile, the publisher knows this note is far from innocuous, because it’s only in the Teacher’s Annotated edition. (I checked Molly’s standard edition to make sure.) I’ll tell you what’s going on here: the publisher knows it has a receptive audience in the instructor … and it’s his or her job to figure out how to subtly inculcate the Americans. The French supremacy theme is further promoted by the never-ending menagerie of intelligent, charming, and nice people you see in these textbooks. You’ll never get a statement like, “C’est Pierre. Pierre est un perdant [loser].” This is true across the board. I can remember a dialogue from my junior high French 1A book: “Est-ce qu’elle est intelligente? Oui! Et est-ce qu’elle est charmante? Oui! Est-ce qu’elle est belle? 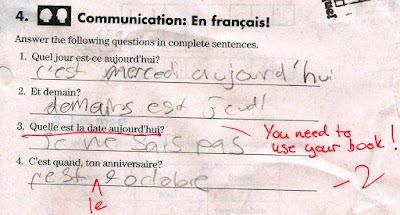 Mais bien sure, elle est Francaise!” [Is she smart? Yes! And is she charming? Yes! Is she pretty? But of course, she is French!] You never get, “Est-ce qu’il va mourir d’une mort horrible d’un cancer du poumon?” [Will he die a horrible death from lung cancer?] even though it’s highly likely more French people smoke than are intelligent and charming. But cultural oddities aside, foreign language classes at the college level are actually very hi-tech. The pride and joy of the department is the Foreign Language Learning Lab. Let me take you on a tour of this outstanding facility. Kerr Hall, home of the Learning Lab, is one of the most modern buildings on campus. I’m surprised it doesn’t have one of those scrolling digital signs. Instead there’s just this printed one: “Learning Lab upstairs.” Interestingly, the Learning Lab is the only place on the whole campus that offers signage of any kind. Up the stairs, there’s another sign: “Learning Lab down the hall.” Down the hall, there’s yet another: “Learning Lab across from this room.” Why all the signs? Well, I have my own theory: this lab is so different from anything we students have ever seen before, we wouldn’t even know what to look for! First, you have to punch the clock, just like at a factory. Unlike me, most UCSB students have probably never been near a factory, so this is surely quite novel for them. I guess the faculty somehow doubts that we students will avail ourselves of this cutting edge learning technology on our own volition, so they have to monitor, and thus enforce, our use of the Lab. And how much usage is that? Let’s have a look at these timecards. Hmmm, Leigh Malone only put in three minutes during her last session. Must have been called away. And the one before that was similarly brief. How much can you really get done in three minutes? And look at this, Rebecca Martin forgot to punch out last week. And Don Stannage forgot to punch in, so he just wrote in the time. Oh yeah, I believe that. What’s that? You’re wondering why I’m punching Leigh’s and Molly’s timecards in addition to my own? Well, we kind of have a deal going. We look after each other. I don’t suppose this is a purely ethical behavior, no, but the Language Lab is 10% of our grade, and we’re just trying to survive. 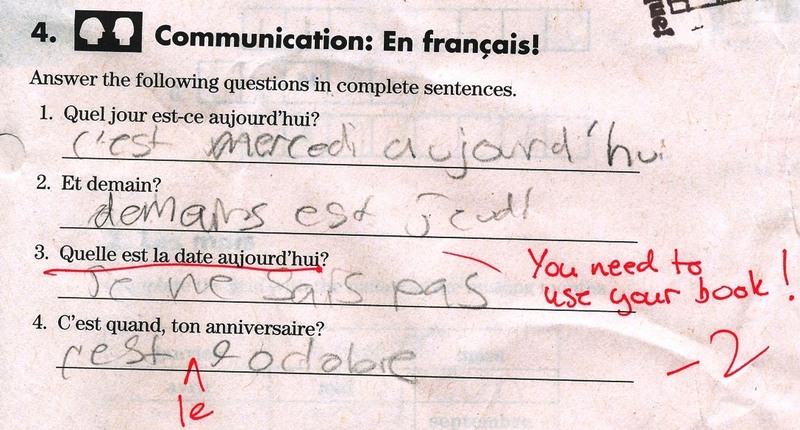 So here’s what you do when you’re actually learning French here. You talk into the recorder, and it tapes your voice. Then, by using the repeat feature, you can listen to your own voice spoken back to you (as long as you keep straight the “Drill” button vs. the “Play” button … that does stymie some of the students). It’s a fascinating experience because not only does your own played-back voice sound high-pitched, nasally, and weird—like your recorded voice always does—but you can tell how bad your accent is, without the instructor having to complain to you in class. That’s the beauty of this technology. Just look out over that sea of heads, all hung low as their eyes scan their workbooks. Well, not a sea, I guess … more of a puddle. But anyway, you are looking at some seriously voracious students. Wait, that guy is bobbing his head around! He’s really getting into it! Look, his foot’s tapping, this guy’s having a great time! Let’s see what language he’s taking: oh, right. Led Zepplin … right there on his tape case. And his workbook seems to be an issue of Rolling Stone. See, at college there are a lot more languages to take than just French, German, and Spanish! I love all the posters in this lab, locked in a bitter struggle for dominance. One arrogant French instructor probably put up the first “France” poster, and then a German instructor felt compelled to represent his country, and on down the line. That’s why there’re about fifty posters on that one wall. And they don’t go unnoticed, either; just look at the students gazing at them. Well, okay, fair enough, they’re actually gazing off into space. But what do you expect? This is college. Over there is the Operations Desk. If you ask the clerk there how to operate the machinery, he’ll give you a tape with all the instructions recorded on it. But it’s a Catch-22, isn’t it? If you can’t work the machine, you can’t play the tape, so you won’t hear the instructions. That’s why you have to bring your Walkman the first time here. What do you mean, “What if you don’t own a Walkman?” This is California, man! Everybody owns a Walkman! This is my favorite poster: “Learning, culture, and friendship at the Learning Lab.” Well, obviously you can learn here, and in the foreign language department, culture always comes with the learning. But friendship? I’ve never made any friends here. Is that because everybody’s plugged into a set of headphones and can’t talk? No, it must mean I’m just not outgoing enough. Standing in line at the cassette library, for example, is a great place to strike up a conversation. If only a line would ever develop. Well, I’ve got some learning to do here, so I’ll have to leave you alone for a while. You can listen to any tapes you want. Just ask the clerk to get you started. I’ll be over here covering Chapter 13, Simon & Garfunkel.